Dime Box Nick commented on how jealous his was that I found some nickel boxes at my local card show a couple weeks back. He had some birthday money burning holes in his pockets, so he took a drive down to my neck of the woods to hit the biweekly show that I attend. My wife was quite kind to let me go back to the show so quickly so Nick and I could meet up. For me, this was a great chance to see the elusive dime boxer in his natural habitat. Which way to the quarter boxes? Nick got there just before me, so I made my usual rounds before trying to find him. First, I hit up my '64 vintage guy. 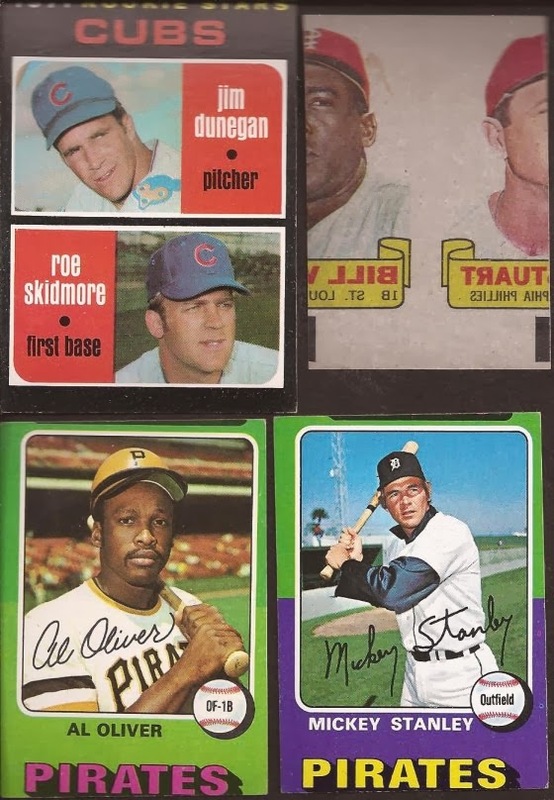 Usually, I score about 15-20 cards, but I think someone beat me to his 3 for a buck bin - I only pulled out five 1964s and one miscut gem. So I kept hunting. 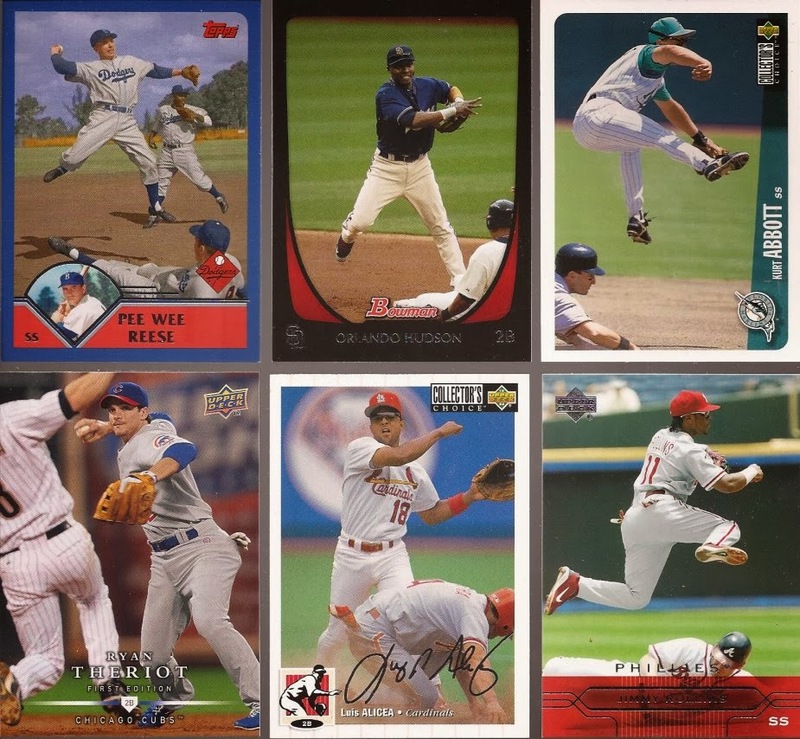 I found a few well stuffed dime boxes, so I pulled up a chair and started digging. 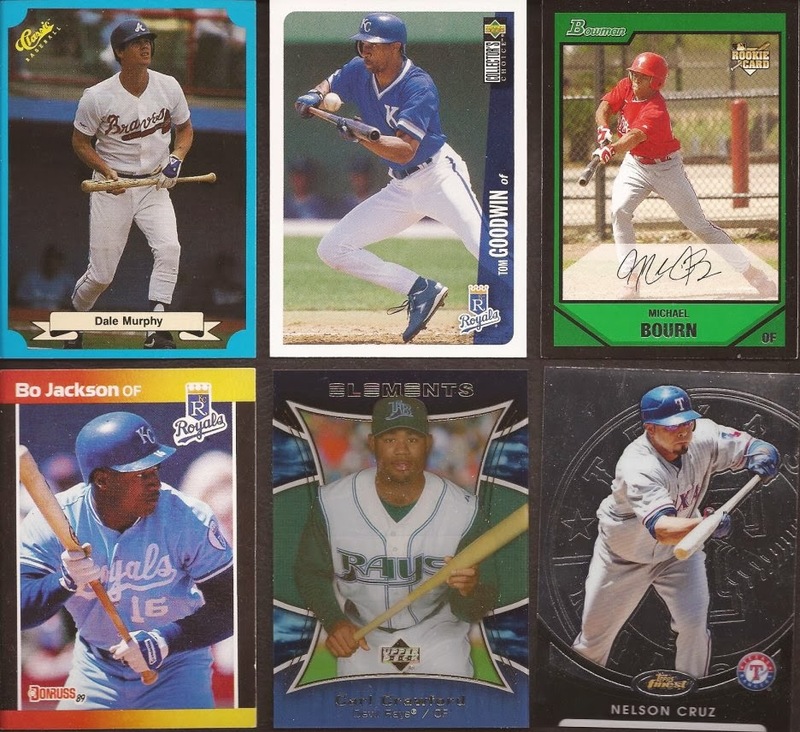 A lot of recent releases in the rows, but older stuff could be found for my collections. A large amount of bunting cards. 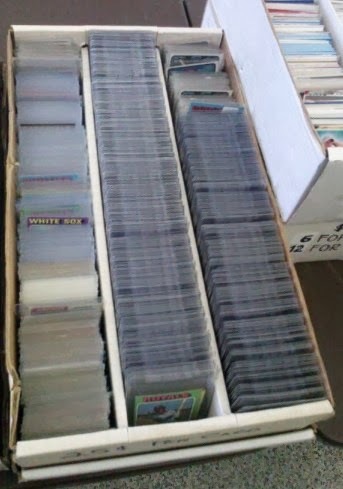 In fact, my search for double play cards is going much slower than I expected, while the number of cards with a players laying one down is picking up quickly. That's not to say DPs were missing from the boxes. Some nice oddballs too. 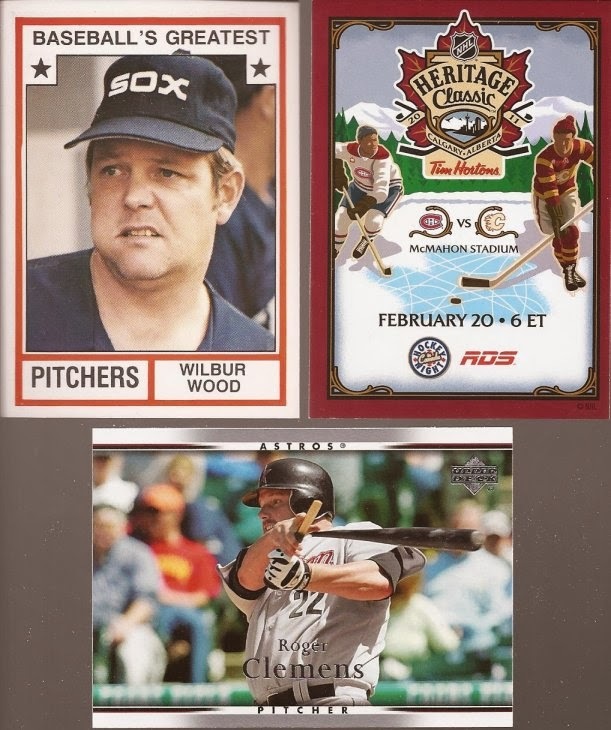 The Heritage Classic is from the 2011 Canadian National Hockey Card Day release. There were a few more boxes to be seen with this guy, but I got a text from Nick of where he was. 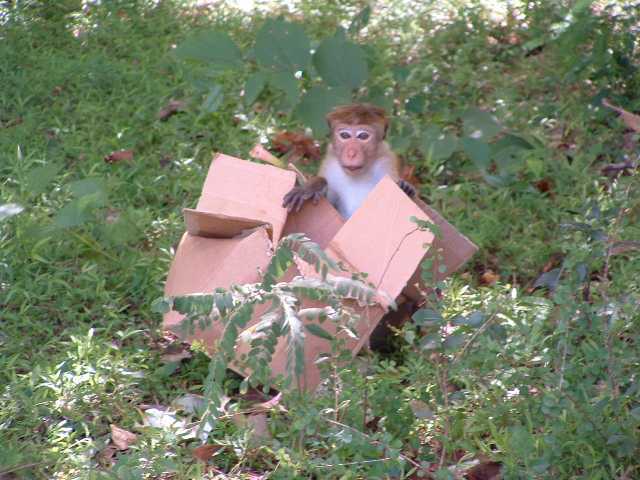 Considering the subject matter, I finished up the box, paid my $3 and went to find him. These three represent about 20 cards I bought from the seller Nick found. Nick picked up about 130 cards. I also picked up one card from this guy for a quarter. All total, it cost us $2. I'll save you the math - one penny per card. Yup - Nick found penny stacks. Technically, the guy owed me about 30 cents in return, but I said to not worry about it. You can see from the quality of these three the edges are rough and some rounded corners. But a penny a card!?! The best part of this scan is I missed out this past week on both the Millan and the Kelleher during my virtual dime boxing. I think both cards went for 20 cents each. I paid two copper Lincolns. I also paid 2 cents for these. From there, I went to a staple vintage guy at the show. I was on a mission for one specific card (obtained), but I also was looking for some Fox's. I found one I was willing to pick up, though it's a little rough. I never knew Nellie did the evil goatee look. I also picked up a Douglas. 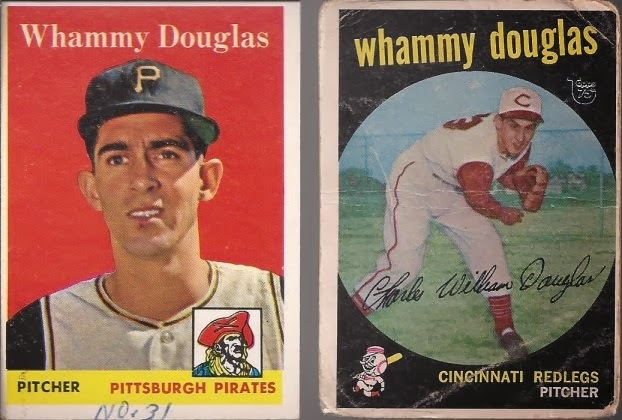 Ya know - Whammy Douglas. I bought the '58 on the left. The '59 buyback on the right a buddy from pack wars last night pulled and gave to me. I have an unstamped '59 of Whammy. 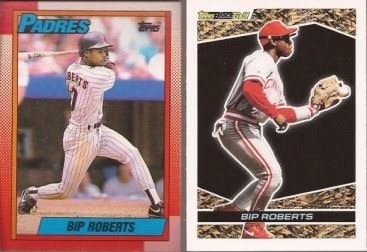 These are also the only two cards ever released during his playing career. Douglas Project COMPLETE! Mmmm - delicious miscuts. Top left came from my 3/$1 vintage guy. The ruboff on the top right came from the above Douglas dealer, as did the fu-manchu Fox. I went to him to get one $4 card. I ended up getting that card, the Fox, the Douglas and this miscut for $4. So free basically. And yes, Night Owl, those bottom two are '75 mini miscuts. Nick found a dealer with a few '75s. How many was his selling? Look at rows center and right. Yup, pretty much all of those were minis. Yes, Night Owl, you can sleep on my couch. Anyway, this dealer hooked me up with some more '64s. Wood rookie for a quarter, just a little miscut. And a Boog for 50 cents. All total I spent $15 this trip. But I didn't leave with just my purchases. Nick was kind enough to bring along a couple team bags filled with goodies. 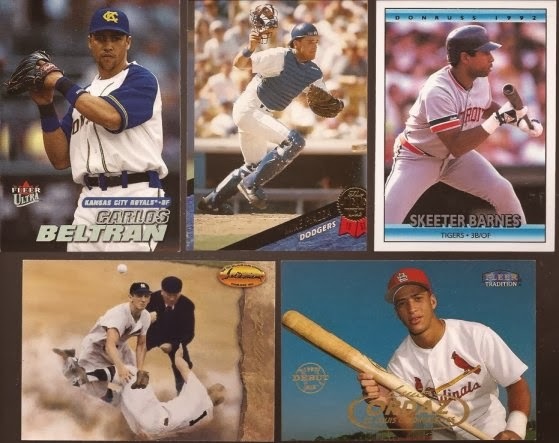 Throwbacks, miscuts, bunting and double plays - oh my. 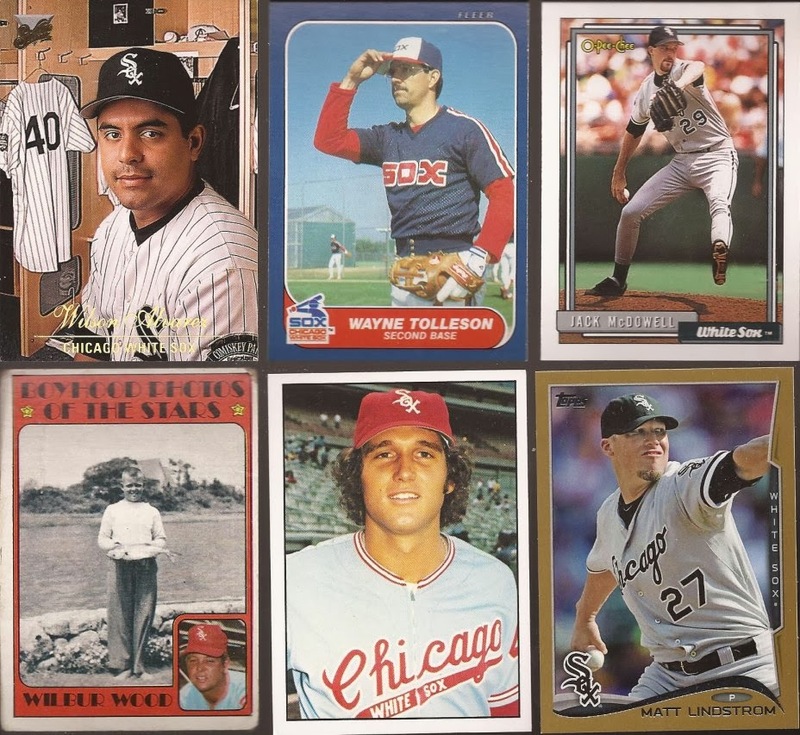 And a lot of Chisox additions. My first '91 O-Pee-Chees. Another great time at the card show, plus a chance to hang with a fellow blogger and an all around great guy in Nick. We were going to hang out after for lunch, but other plans got in the way. No problem cuz there will always be another time. If I ever saw two rows of '75 minis like that I'd still be there. Right now. There. Always. How did you not buy this guy out? To see the Dimebox Wonder in his natural habitat must have been a real treat. I'll need to snag a copy of that Felix Millan - the yellow jersey/pinstripe pants is a pretty rare combo that I *think* the Bucs only wore during spring training. And congrats on completing the Whammy collection. I met him last year at an autograph signing, and he was definitely an interesting guy even at his age. Got some nice cards there ! But no pics of the two of you together ? It was great seeing you again, Jeff! Sorry we couldn't do lunch this time around, but we'll definitely grab a bite the next time we meet up. Glad you liked the team bags. 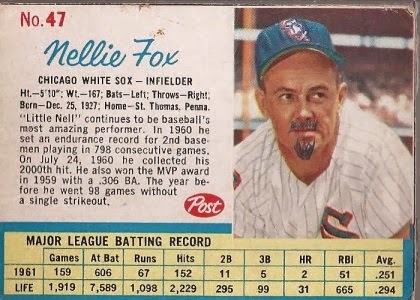 As for your finds, I'm really loving that defaced Nellie Fox and the miscut cards. A little humor is always good in this hobby. Great double dip/bunting cards as well. I actually pulled a second copy of that Classic Dale Murphy from that same dime box after you told me about that dealer. A great day all around, Jeff. Thanks for inspiring me to hit this show and hopefully I'll see you there again sometime soon. Leave it to Nick to find Penny Stacks. You had some amazing finds. That Nellie goatee is sweet! Hats off to the artist. Looks like fun! I'm with NO, I think I'd be all over those minis! Are you putting the '64 set together, or just buying pieces here and there?